If you've ever been to Travers Day or Whitney Day at the Saratoga Race Course, you know these races are some of the most popular of the season! You also know that the winner of these races receives a floral blanket, a beautiful, hand-made blanket made of over a thousand carnations. Did you know that the winner's blanket is made right here in Saratoga? Yes! Since 1994, Susan Garrett, a Saratoga native, has been creating the floral blanket that is presented to the Travers winner. Since then, she has also been commissioned by Marylou Whitney to create the floral blanket for her namesake race, The Whitney Stakes. Not only has Garrett been designing and creating these blankets for over 18 years, but she also is responsible for bringing the tradition to the Saratoga Race Course. Read on to learn more about how she got started. Read our 10 Question Interview with Susan Garrett and get all the info on the blanket, how it got started and how it's created! 1 ) How did you get started making the floral winner's blanket? After years of watching the races at the Belmont Racetrack I realized that the oldest Stakes race in the country, the Travers, didn't have a winner's blanket of its own. At the time, my father was the New York Racing Commissioner, so I got in touch with Terry Meyocks, the Vice President of NYRA, and he gave me the okay to make the first blanket in 1994. 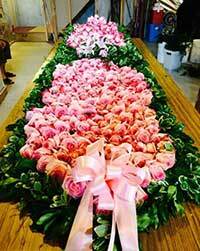 2) Do you have florist experience? Yes. I am a floral designer and used to own a florist shop next to the Wishing Well Restaurant in Saratoga Springs. Now, I do floral work for fun. 3) How many carnations do you use for each winner's blanket? 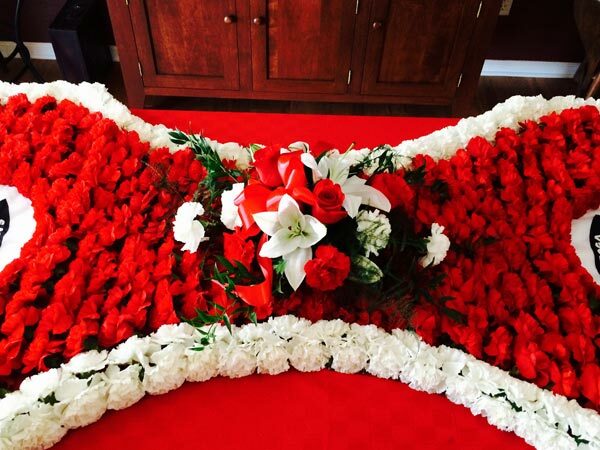 It takes 1,500 or more carnations to complete each blanket. 4) How big is the blanket? 5) How did you come up with the design for the blanket? The first winner's blanket was red and white, for the Saratoga Race Track, and had a "T" for Travers. It was largely based off the blankets presented at the Belmont. As the years have gone on, it has become more of a science and the shape has gotten longer and more tapered at the end. This is so that it can hang over both sides of the winning horse. 6) How far in advance do you make the blanket for Travers? I sew the felt blanket a few days in advance. The night before the race is when most of the work is done. The flowers are glued on, and once the glue is dry, each flower is then individually sewn on. 7) Do you have any helpers? Yes. I invite friends and family over to help, and we make a night of it! 8) What happens to the floral winner's blanket after the Travers race day is over? The first blanket is now housed in the National Museum of Racing, but as for the others, they belong to the owner of the winning horse, and it is theirs to take home or do what they please with. I have seen some taken back to the barn, others are auctioned off for charity and then displayed around town. It's up to the winner. 9) What do you do for the other 364 days of the year? I am now a personal assistant and nanny. I no longer work with flowers professionally, but I help out at nearby Jan's Florist occasionally. After the race I enjoy painting the winning jockeys. It has become a tradition for me to paint the winners in front of the Wishing Well Restaurant in the colors of the winning connections. 10) You have started and continued a GREAT tradition at the Saratoga Race Course - how does it feel? It's exciting. The 15 seconds of fame is really fun, and I am honored to be able to be a part of this historic pastime!